Please do shopping in my store without worry. Engine type (name): GXV 50T / Engine (type): Air-cooled 4-stroke single cylinder OHV / Total exhaust gas (total length × total height × full width): Approximately 1060 × 990 × 475 mm / (KW [PS] / rpm): 1.6 [2.2] / 7000 / rpm Number of crankshafts per minute (cm 3): 49.4 / Continuous rated output / revolution speed (kW [PS] / rpm): 1.1 [1.5] / 4600 / Fuel used: Automobile unleaded gasoline / fuel tank capacity (L): 0.35 / Ignition system: Transistor type Magnet ignition / Starting system: Recoil starter (manual) / Main clutch type: Centrifugal clutch / Number of shift steps (stage): Forward 1 / Rotor [Plowing width (mm)]: 450/250 (at the time of inner nail) / Rotor [nail diameter (mm)]: 250 / rotor [rotation number (rpm)]: 135 / safety appraisal number: 26173/10 / About Us. The item "HONDA Japan-Engine type TILLER Cultivator FG201 JT \ Tracking" is in sale since Sunday, January 27, 2019. 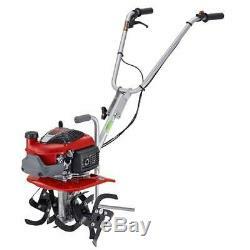 This item is in the category "Home & Garden\Yard, Garden & Outdoor Living\Outdoor Power Equipment\Tillers".